Did you see the winner of the Woombie giveaway? Scroll down or click here. 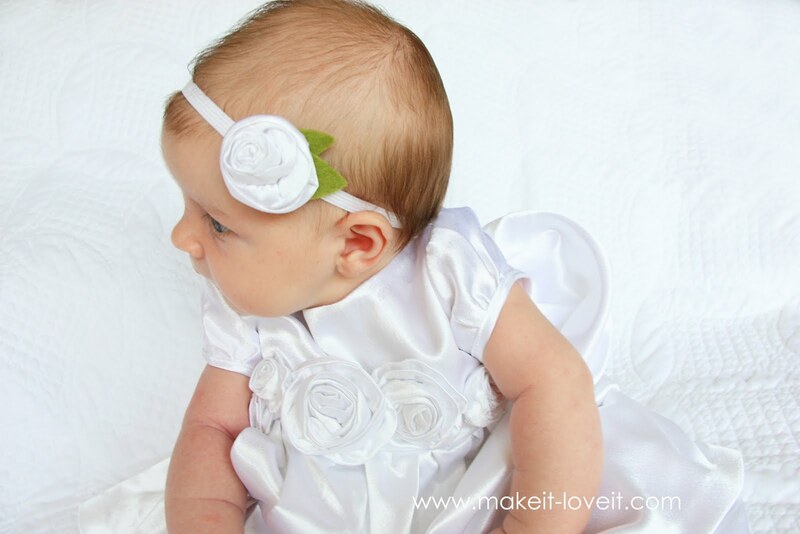 Yesterday, I mentioned that I made those little shoes and a headband (found here) to go with a little white dress. Today, is little white dress day. Our little baby girl’s blessing day was a couple days ago…….and my heart can’t help but melt at the sight of a sweet and innocent baby in all white. It’s purely angelic. The dress was long, much past Baby Girl’s sweet kicking feet……..
………with a great double layer of fullness. With a whole cluster of those crushed fabric flowers on the bodice, from yesterday’s post (found here). I just love seeing any sweet baby on blessing/confirmation day……but I particularly adore my own children. Thank you for joining our family, Baby Girl. Would you like to make your own dress/gown for a special occasion? Before we start, I created this dress from scratch, patterning it off of a dress we already had. But you could use a simple dress pattern and just make it longer, or buy a white dress and add flowers and such to it. Do whatever works best for you and/or your time restrictions. But here’s how I created my dress. **I purchased some really flow-y satin for this dress at Hobby Lobby. I’m not sure what it was called. But I have seen it at Joann’s too. I grabbed a dress that fit Baby Girl and folded it in half. Then I traced around the bodice……..scooping low at the neckline for the front bodice piece first. The bodice on this dress was shorter than I wanted so I extended it down to where I drew that red line. Then I added about a 1/4 inch all the way around and about a 1/2 inch to the bottom…..for seam allowances. Then I traced around this piece on a new piece of paper as a guide for the back bodice piece. And then extended the center back line out about an inch. I did this because I needed extra fabric along the back so that the fabric could overlap for the button closure. Here are my two pattern pieces for the bodice. The front piece and back piece. Next, I cut a front piece out of my satin fabric and one out of the lining……both on the fold. So then, after it’s opened up, each are one piece. But then I cut 2 of the back bodice pieces out of the satin and 2 pieces out of the lining. Then, starting with the satin pieces first and with right sides together, I sewed the 2 back pieces to the front piece…….along the sides and at the shoulders. (Not the arm holes or neck opening.) Then do the same thing with the lining pieces. Now, you’re going to attach your lining bodice piece to your satin bodice piece. Place the two together, with right sides together, and pin all along the neckline and then down the 2 sides. Then sew the two pieces together, right where your pins were. (I used a 1/4 inch seam allowance because that’s what I added to the pattern piece when drawing it out.) Then trim your edges and zig-zag your raw edges if you didn’t use a serger to begin with. Next, you’ll need to create a pattern piece for the sleeve. Grab your original dress again and lay it down. It’s kind of hard to see the exact shape without unpicking the seams on this dress……but try to get the basic size of the sleeve……..
My pattern piece is the half piece in the upper right. I used that to cut out sleeve pieces on the fold of the fabric. Measure the arm hole opening of the dress bodice and then gather in the bottom of the sleeve first (plus leave it a little longer for the seam allowance). Then cut a strip of fabric out of the satin that is as long as the bottom of your sleeve and then as wide or as narrow as you’d like the bottom edge of your sleeve to be. I cut mine about 1 1/4 inch wide. Pin the strip to the bottom of the sleeve with the right side of the strip facing the wrong side of the sleeve. Then trim off any excess fabric so that it’s not so bulky when folding the strip over later on. Here’s a view from the other side. This is the right side of the fabric facing up…….and the strip is on the back side. Then, turn the sleeve over to the back and fold the strip down and iron it down flat. Then turn the sleeve to the front and then fold the strip over to meet the bottom edge of the sleeve………. And then fold it over again, right over the bottom edge of the sleeve……..hiding the seam below it. Pin the strip in place all along the bottom of the sleeve. Sew it in place and iron it flat. Then fold it in half, with right sides together, using the seam allowance that you allowed yourself. Zig-zag or serge the two ends together. Then slide the sleeves into the arm hole openings in the bodice (right sides together), matching up the side seams of the sleeves with the side seams of the dress. Place the right sides together and pull on your basting stitch to ruffle up the top of the sleeves just a bit, and pin the entire sleeves in place. I did this with the bodice turned inside out……so this is the lining fabric you’re seeing. Then stitch the sleeves in place and then zig-zag the raw edges. Turn the bodice right side out and iron everything flat as best you can. 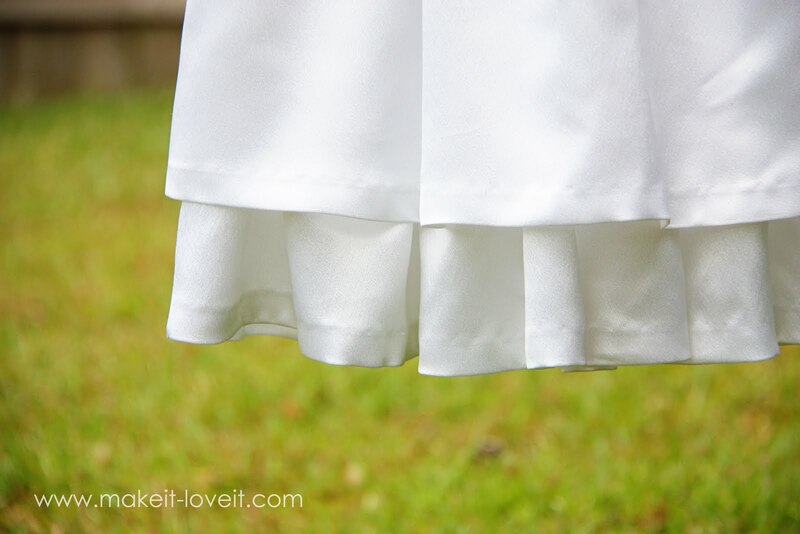 Then, add some button holes to the back of the dress. Then add your buttons and button the bodice closed (I pinned mine because I needed to run to the store later to buy more buttons). Set the bodice aside. Next, onto the skirt portion of the dress. Decide how long and how full you want the skirt portion to be. And if you want 2 layers at the bottom or not. Here’s what I did. I wanted my skirt section to be about 18 inches long and only semi-full. I measured the opening of the bottom of the bodice piece, which was 18 inches. I decided that about double that would be plenty full for the first skirt section. So the first skirt piece I cut 40 inches wide and 16 inches long. The 2nd skirt piece I made twice as wide, so that it would ruffle even more than the first layer. I pieced some fabric together to create a piece that was 80 inches wide and about 13 inches tall. (You don’t need it as tall as the first.) And then I cut a lining piece that was about 30 inches wide and 12 inches tall. Then, I sewed all 3 pieces into tubes, sewing the 2 shorter ends together for each individual section. Here’s an up close image of one of the sections. I serged the two shorter ends together to created a tube……and then just serged all along the top opening, just so the fabric would fray so much when gathering later on. Do this with all 3 tubes. Then, sew a basting stitch along the top edge (the edge where you serged or zig-zagged to keep your fabric from fraying). Then, slide all of this inside of the lining fabric (that’s sewn into a tube) and gather up the lining until it matches the width of the bodice and outer skirt piece that are already pinned together. Now pin all three section (bodice, outer fabric, and lining) together. Here’s everything all pinned together. Then sew in place (I used 1/2 inch seam allowance) and then zig-zag or serge the raw edges together. Turn right side out and here’s how it looks from the front……..
Then, flip up the top layer of fabric and attach the last section of fabric (sewn into a tube) to the lining. You’ll have to measure to see that it comes down as long as you’d like it. Mine falls 3 inches longer than the top layer of fabric. Gather and pin the fabric to the lining………then stitch in place. Then hem the bottom of the layers. I hand-stitched my hems in place, using a blind stitch, giving it a more invisible look. Then I hand sewed some of the crushed fabric flowers to the bodice, using the tutorial from here. Iron everything again, to ensure your fabric is smooth and laying flat. A brand new dress, created by you, for any occasion that you’ve been planning for. What a beautiful confirmation dress and such a lovely daughter of yours. Your blog is such an inspiration. Thanks for the tutorial. 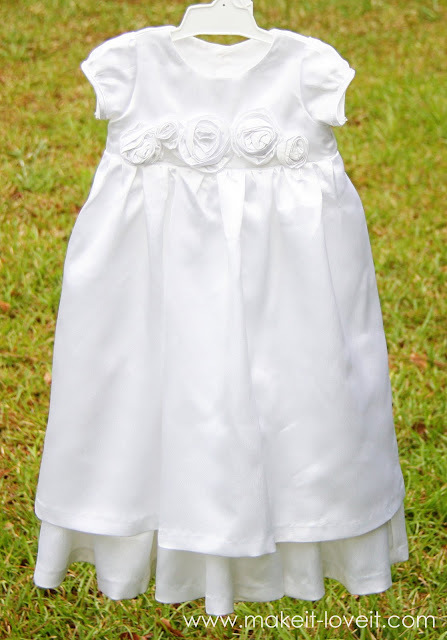 I am hoping to make a Easter dress for my 2 year old daughter and a confirmation dress for my on the way baby girl. Have a great one and good job! The dress and your daughter are stunning. You gave such a great tutorial – thank you! my mom got the honor of making all 4 of my kids' blessing outfits. Congrats on your daughters blessing. What a beautiful dress for such a special day! Did you make the shoes too? I didn't notice if you mentioned it in the post. Great tutorial! What did you use for the lining, more statin? Blessing day is in a month and a half, I hope I can pull this off in time! WOW!!!! I love it!!! I didn't make any of my baby's blessing dresses – but with your help, I think I will be able to make a dress for my 18 month old baby girl. The dress and baby girl are WONDERFUL!! Such a beautiful dress! My son is getting baptised next month and I wanted to make something special, but I don't think I'll have time before then… Very very beautiful! That is just beautiful! You made it look so easy to use an existing dress as a pattern, I might have to try making Easter dresses for my girls. It's hard to tell from the pictures, but I think the fabric might be crepe-back satin. Hopefully that helps someone. Everything you do is AMAZING!! I've never seen a tutorial for a blessing dress before and this is incredible. Congratulations on the special day! That is so so so so SO adorable!!! I would just like to say that I greatly admire your skill in being able to take a dress and make your own pattern from it. I find it so hard to find sewing patterns I like (and can follow!) and you give me hope :) Great job! Grandma makes these for our girls. She has hand embroidered on the slip their name, birth date and blessed date so that as they have their own children the gowns can be used again as an heirloom and a piece of family history. This is so fabulous! I am not great at understanding directions in a pattern, but I tend to wing it a lot. I didn't know it was so allowed, but here you made something beautiful just the way I would prefer to!!! Thanks for sharing this because now I am getting more confidence for my winging it urges! Beautiful!! Beautiful baby and beautiful dress, you make it look so easy! I love it! So beautiful — the baby and the dress! Completely precious. You did wonderful, as usual. Your sweet baby is just darling. You give the BEST tutorials, like seriously, you make this look so simple, THANK YOU for that!!! I've often tried to trace a dress of my daughters to make a new one and get hung up on the sleeves. It appears that you trace the sleeve backwards. You trace the outside of the sleeve for the part that is supposed to attach to the bodice and make a straight line along the bodice for the end of the sleeve. Can you explain a bit better how you traced the sleeve? Thanks! I love to see your many creations. Your blog has inspired me to be more creative. I love to recycle clothes. I found a beautiful white dress with embroidered purple flowers at a thrift store . I cut it up and made a gorgeous blessing gown for my little girl. What a beautiful blessing gown! Soooo beautiful. I am sure your day was sweet. P.S. Rice Krispies are Gluten Free in June! Just lovely! The dress, and the sweetie in it. I made the dress we used for our two girls' blessings. It was the hardest sewing project I've done, but so worth it. Thanks for sharing yours! very pretty! Your dress turned out great and what a tutorial! 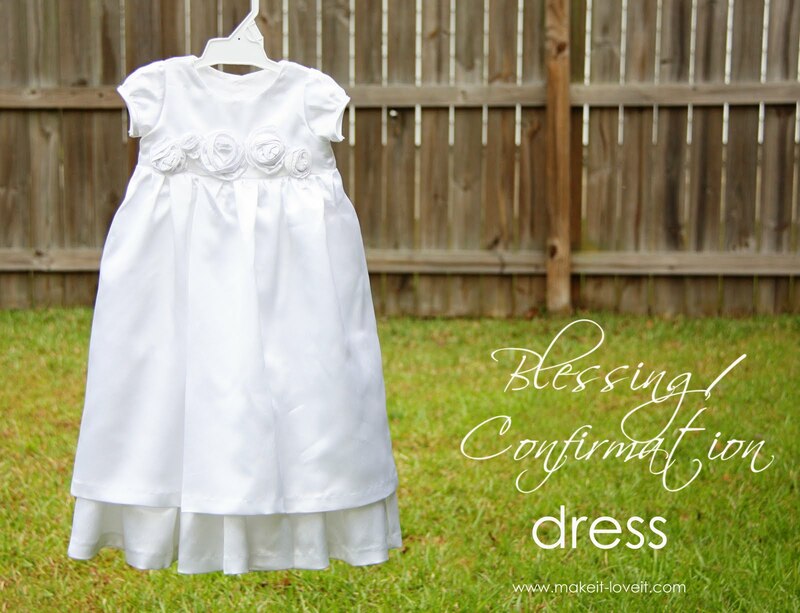 I made my daughters blessing dress too and have a pic up on my blog as well. Can't wait to make my oldest daughter's baptism dress in a few more years! Just beautiful. Great job! Wow! This dress is gorgeous. I can barely sew in a straight line. What a talent you have! All right, I'm sure everyone says this, but you are just awesome. I just don't make things without patterns, but I think I might have to give it a try. You make it seem so easy. Thanks! 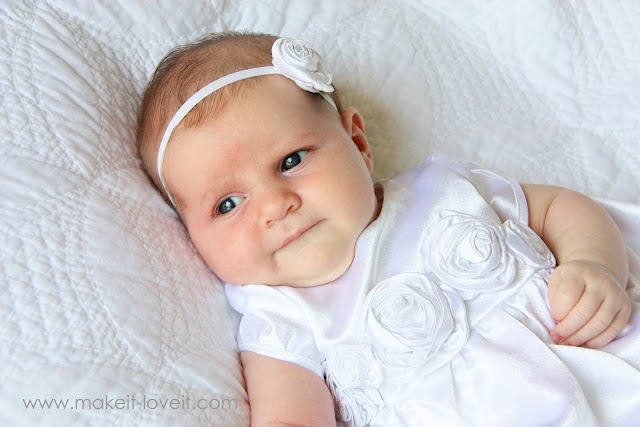 Babies do look super sweet in white, and I like little boys in white gowns for blessings and confirmations, too — so old-fashioned :) I have to brag and say that we all use the blessing dress my grandmother made for my big sister. Heirloom = no work making the dress, plus, well, it's an heirloom. Such a beautiful dress and what an adorable baby girl. 'You make it, We Love it'…! So precious… I know a couple people that have dyed it after they have used it so they can wear it more than once! That is really gorgeous and thank you for a great tutorial. Love it! The fabric looks like satin dupoini. Love that stuff. Beautiful. My mom made my girls' blessing dress out of my wedding dress that she made. I love it and you're right that it's a shame it's only worn once. Congratulations! Amazing dress and wonderful tutorial. You're tutorials are always so amazingly detailed. I know it takes longer to do your projects by doing these but know that it is really appreciated. Enjoy your blessed event. I've been working on a shirt dress for my daughter and could not figure out the sleeves at all. Your explanation makes perfect sense! I can't wait to finish the dress now. Thanks for your tutorial! When she gets married (ya know, way down the road) you can then turn her baptismal gown into something special on her wedding day. Either part of her wedding dress, her bridal bag…etc. So cute! I'm sure she'll treasure her dress when she's older! I seems so difficult to make such beautiful clothes. DO you want to make me one!!! hahaha. SO CUTE! I definitely wnat to makeone now!! I think the dress is beautiful! My mother got advice from her mother, who got it from her mother………..
that just for kicks, dress her in the dress at least one more time for church before she grows out of it.I'm not your mother, but I thought I would pass it on to you. Beautiful. I have never made anything with sleeves for my daughter. I'm not brave enough to try but I think I might after this. Thanks. Absolutely stunning. I loved the simplicity of the dress and the flowers made it modern. Perfect. It is beautiful! Definitely save it for her! We just blessed our baby in the dress my mother made for me. It was so precious to compare the picture of me in the dress, and my sweet daughter in the same dress! This is lovely, I have the fabric ready to make my niece a Christening dress. This is just the inspiration to get me started. What a great dress for a little one! Just a couple years ago I was on the hunt for a blessing dress for my little girl only to find nothing but sleeveless! I ended up making my own, but would have loved to have this pattern back then. It turned out SO lovely. Well done! Esse vestido é um sonho e adorei o tutorial, pois estava louca procurando por um modelo pra fazer para minha filha que ia receber benção agora dia 03 e seguindo o tutorial fiz o meu e ficou lindinho tb, ainda mais que nunca havia costurado roupas. Bjs e adoro seu site. This dress is a dream and I loved this tutorial, it was crazy looking for a model to do for my baby who would blessing name in July 03 and following the tutorial I did my pretty dress, I never even sewed clothes before. Kisses and I love your site. I made this and I’m not a sewer, but it turned out adorable! It made our baby blessing so special! Thank you so much! I got lost, sorry maybe it’s lack of sleep and children jumping all over me as i’m going through it lol when sewing the skirt to the bodice do you sew the front skirt and lining to the top? then after when placing the last peice in on the lining is it further down than the waist… would the seam show through the top fabric? Absolutely gorgeous! I made one just like it for a friend’s daughter. Turned out beautiful! Thanks for sharing! our daughter who is now 17 was adopted 5 years ago when she was 12 from an orphange in north ireland.We are catholic and three months after we got her we baptized and christened her as an infant thru the infant baptism program at our parish.My sister made a beautiful white below the knees baptism gown for her with boufant shoulders and lace down the front.she made a bonnet and booties to match the dress also.we got white tights to go with the gown and then did a cloth diaper and rubber pants under the tights with a white tee shirt.we dressed her in the nursery that day just like an infant while she laid in a baby crib.she looked absolutely stunning in the outfit and very pure and infant like.i picked her up to receive the water on her head and it was very special.She made her first holy communion two years later at 14 and we dressed her in a beautiful poofy communion dress and veil with her baptismal diaper,rubber pants and tights under the dress.we did white ‘mary jane ‘ shoes with the outfit. How many yards did you use? I have to thank you so much for your tutorial! 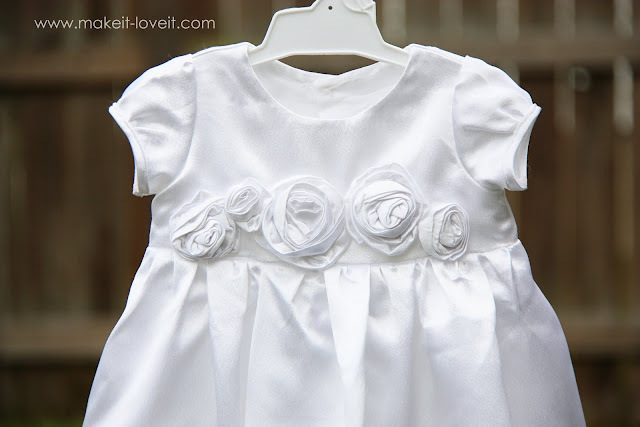 I needed to make a baptismal gown for my daughter and I had no idea where to start. I looked at patterns and everything seemed unnecessarily complicated. I came across your blog and I was so inspired and knew with your help I could figure something out. 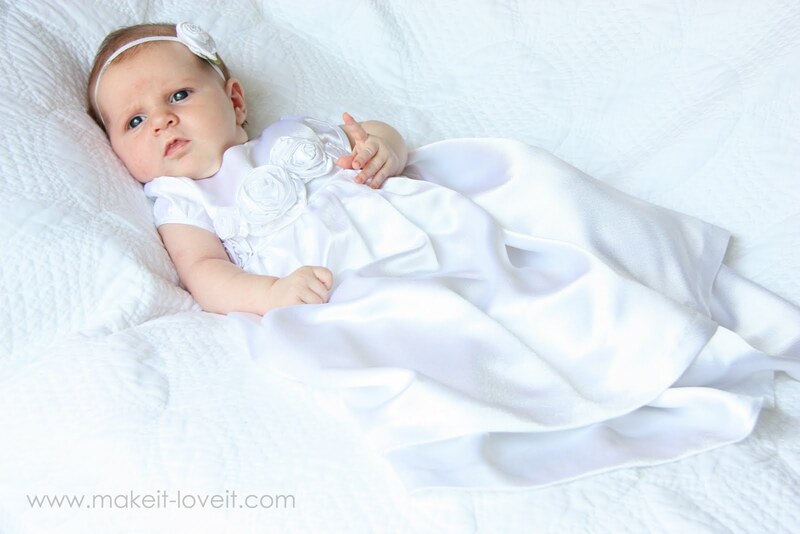 Thanks to you I made a beautiful baptismal gown! Thank you for making this tutorial!!! I have never made clothes before. I usually stick to the easy stuff. Baby blankets, bags ,shower curtains sheets etc. But i wanted to challenge myself and sew my daughters baptism dress. THANK YOU. SOOOOOOOOOO much. For this tutorial. I’ve been sewing all evening and it looks very good for my first time.